The PL100i Applicator provides capacity for die-cut adhesive components up to 100 x 100mm in size and is configured specifically for integration with automated assembly systems. Typical placement accuracy is +/- 0.35mm (+/- 0.014″). To learn more about the PL100i CLICK HERE. The PL100r Feed and Peel System provides capacity for die-cut adhesive components up to 100 x 100mm in size and is configured specifically for integration with external robotic or picker systems. Typical feed accuracy is +/- 0.35mm (+/- 0.014″). To Learn more about the PL100r CLICK HERE. Specialized Tamp Modules for the PL100r/PL100EPr CLICK HERE. To Learn more about the PL100EPi CLICK HERE. The PL100r Feed and Peel System provides capacity for die-cut adhesive components up to 100 x 100mm in size and is configured specifically for integration with external robotic or picker systems. It incorporates our optional EP Package which enhances the system to provide typical placement accuracy of +/- 0.1mm (+/- 0.004″) . To Learn more about the PL100EPr CLICK HERE. The PL100 Applicator is available with an Electric Tamp module. The PL100i-ET200 or PL100EPi-ET200 can be selected for your application. The Electric Tamp unit (ET200) provides 200mm stroke, rapid acceleration and deceleration, digital control of the tamp motion profile, elimination of two pneumatic cylinders and associated sensors and flow controls, and reduced compressed air consumption. To Learn more about the PL100‐ET200 (Electric Tamp) CLICK HERE. 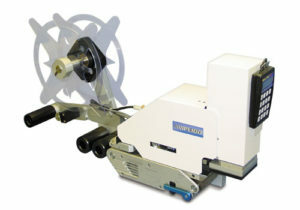 The PL100 Applicator is available with a Side Scan Tamp module. The PL100i-SS or the PL100EPi-SS can be selected for your application. 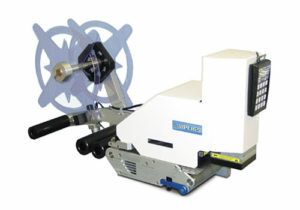 The Side Scan Tamp module provides an additional axis of motion control to allow the Tamp to move on a horizontal plane. This module is typically implemented for applications in which the die-cut adhesive components may include variation in the position on the liner in the non-feed or cross-web axis that exceeds the allowable specification for the assembly. To Learn more about the PL100SS (Side Scan) CLICK HERE. The RT90 module is available for integration on PL100r and PL100EPr Feed Systems. It is intended for components up to 50 x 50mm in size. 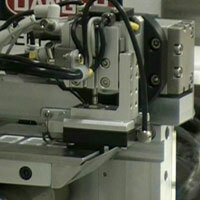 This module provides the unique function of removing the adhesive component from the liner on one plane and then rotating the adhesive component 90 degrees to reposition the adhesive component on a plane perpendicular to the peel surface with the exposed adhesive surface facing away from the vacuum chuck. The RT180 module is available for integration on PL100r and PL100EPr Feed Systems. It is intended for components up to 50 x 50mm in size. This module provides the unique function of removing the adhesive component from the liner on one plane and then rotating the adhesive component 180 degrees to reposition the adhesive component in an ‘upside down’ orientation relative to the peel surface with the exposed adhesive surface facing away from the vacuum chuck. The PL165i Applicator provides capacity for die-cut adhesive components up to 100 x 165mm in size and is configured specifically for integration with automated assembly systems. Typical placement accuracy is +/- 0.2mm. To learn more about the PL165i CLICK HERE. 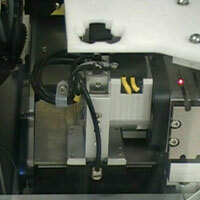 The PL165r Feed and Peel System provides capacity for die-cut adhesive components up to 100 x 165mm in size and is configured specifically for integration with external robotic or picker systems. Typical feed accuracy is +/- 0.2mm. To Learn more about the PL165r CLICK HERE. To Learn more about the PL165EPi CLICK HERE. 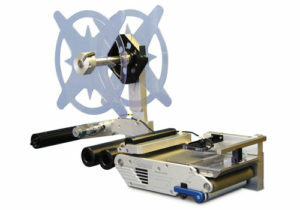 The PL165r Feed and Peel System provides capacity for die-cut adhesive components up to 100 x 165mm in size and is configured specifically for integration with external robotic or picker systems. It incorporates our optional EP Package which enhances the system to provide typical placement accuracy of+/- 0.1mm (+/- 0.004″). To Learn more about the PL165EPr CLICK HERE. The PL165 Applicator is available with a Side Scan Tamp module. The PL165i-SS or the PL165EPi-SS can be selected for your application. 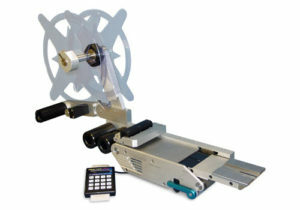 The Side Scan Tamp module provides an additional axis of motion control to allow the Tamp to move on a horizontal plane. This module is typically implemented for applications in which the die-cut adhesive components may include variation in the position on the liner in the non-feed or cross-web axis that exceeds the allowable specification for the assembly. To Learn more about the PL165SS (Side Scan) CLICK HERE. The Series 1 Base is a standard automation platform configured specifically for tabletop operation of our standard Applicator products. The Series 1 Base provides a common platform for mounting and alignment of any PL Series Applicator and a Nest/Fixture for locating your product as the adhesive component is applied. It includes a two-hand anti-tiedown control for Operator Safety and can be configured with additional optional guard hardware if required. In addition to standard Fixtures we can provide customized Fixtures that incorporate actuators or special devices to assist in presenting or aligning your product for assembly. To Learn more about the PL Applicator Accessories CLICK HERE.